As is the practice in this parish, to prepare for the Feast of Our Patroness, we held a novena in honor of Our Lady of Guadalupe during the Evening Masses. On December 11, after the 7:00 pm Mass, Fr. Marlon Beof, OAR, led everyone to the parking area for the coronation of the statue of Our Lady of Guadalupe after which he pronounced the Parish Fiesta officially open. For the next twenty-four hours, thousands of parishioners and guests from all walks of life came for the flower offerings and mañanitas serenading Our Lady, participation at Eucharistic celebrations and to enjoy the different booths offering food and religious articles. At the parking area, Fr. Marlon, Deacon Miguel and Altar servers after the crowning of the Statue of Our Lady of Guadalupe on the Eve of her Feast. On the Day of the Feast of Our Lady at 4:30 am, Bishop Kevin Vann presided over a concelebrated Mass with Fathers Marlon, Alfredo de Dios, OAR, and Jose Antonio Arias, OAR. 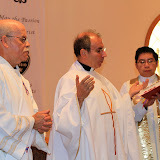 Deacons Domingo Garza and Miguel Gonzalez assisted at the Mass. Bishop Kevin Vann accompanied by Frs. Marlon, Alfredo, and Jose Antonio and Deacons Domingo Garza and Miguel Gonzalez after the Mass on the Feast of Our Lady of Guadalupe. After Mass, Bishop Kevin Vann blessed our new community chapel located in the Rectory. The highlight of the Advent Season was the nine day Christmas Posada before each 7:00 pm Mass. Posadas are an important part of Mexican Christmas celebrations. The word posada means "inn" or "shelter" in Spanish, and this tradition re-enacts Mary and Joseph's search for a place to stay in Bethlehem. Posadas are held on each of the nine nights leading up to Christmas from December 16 to 24th. To the delight of children and their parents this year, we also had Posadas with the CCD students during their respective days of CCD classes. On December 24, Fr. Marlon presided at the 5:00 pm children’s Christmas Eve Mass; this was the second time we held it in our parish. The children's choir helped to enrich the celebration. At 11:00 pm, Fr. Jose Antonio Arias presided over the Noche Buena Mass with Frs. Marlon and Alfredo concelebrating. On December 31 at 9:00 pm, Fr. Alfredo de Dios presided over the Noche Vieja Mass with Frs. Marlon and Jose Antonio concelebrating. The Mass was followed by a Holy Hour led by Fr. Marlon to thank the Lord for the blessings for the end of 2014 and asking God’s blessing for everyone and every family in the parish for the New Year.